Some pie recipes call for a prebaked pie shell. Custard pies or pies with pudding-type fillings, ice cream pies, or any pie that uses a filling that doesn't require baking in an oven, uses a crust that's baked ahead of time without the filling. Make your pie pastry from scratch or buy a refrigerated or frozen pie shell to bake. Bake the shell the day before you make your filled pie. Move the oven rack to the lowest level and preheat the oven to 425 degrees Fahrenheit. 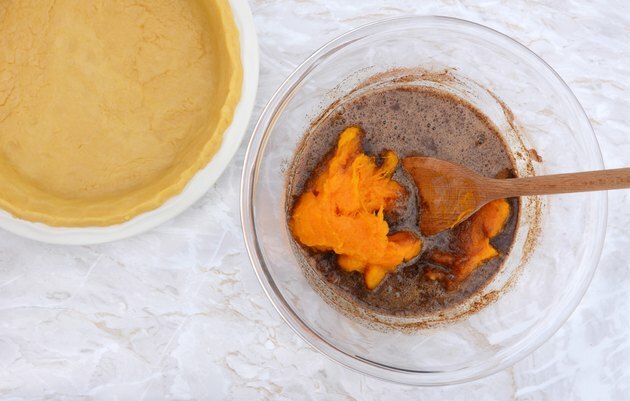 This will help ensure a crisp pie crust that isn't soggy in the middle. Place your pie pastry in a pan. Pat the dough down firmly in the pan and crimp the edges of the pastry with your fingers or a fork. Trim excess pastry with a sharp knife. Prick the pastry all over with the tines of a fork. This creates many tiny holes to allow steam to escape and will help prevent the pastry from bubbling up in the bottom. This will also help the crust to remain crisp. Bake the pie crust in the preheated oven for five minutes. Open the oven door and check to see if the pie crust is bubbling up anywhere. If so, gently press down on these areas with the back of a large spoon. Continue to bake the pie crust for an additional 10 to 12 minutes, until it is very lightly browned. Remove the pie from the oven and allow it to cool completely before filling it. You can weight the center of the pie with dried beans or rice to keep it from bubbling up, but according to the Fanny Farmer cookbooks, this increases the likelihood of the middle of the pastry being undercooked or soggy. How Many Calories in a Serving of Sheet Cake?